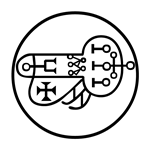 The Goetia is Book 1 of the Lemegeton (Lesser Key of Solomon), a grimoire that circulated in the 17th century and is penned in the name of King Solomon. It contains the names of 72 spirits, collectively known as the Shemhamaphorash, and what their specialties are. The text within this site is taken from SL MacGregor Mathers' translation, published in 1904.